President Shimon Peres said Tuesday that he was proud of operation and conduct of the Israel Navy Commandoes who participated in the raid of the aid flotilla heading to Gaza Strip, Monday. 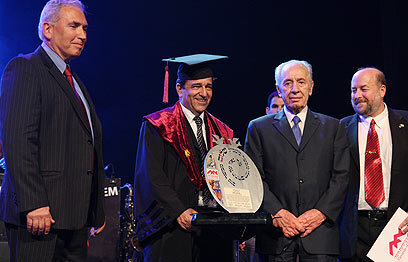 Speaking at a Haifa University ceremony Tuesday, where he was given the Haifa University Board of Trustees Leadership Award Ceremony, Peres said that "the soldiers were beaten just because they did not want to kill anyone. "Any other army would have immediately used their guns. What we saw was an exemplar of troops who preferred getting hurt over hurting someone else. "If there is one humane thing, it is this kind of trial by fire – to stand there, being shot at, and do nothing. I do not wish that on anyone." Peres laid blame for the bloody maritime incident with Hamas, saying the militant group was solely to blame: "In stead of sailing and demonstrating, these people should have been talking to Hamas. "Gazans are not burdened by us, but by Hamas. They should convince Hamas to stop its terrorism and resume negotiations, in stead of resisting peace. If that happens Gaza would thrive." Commenting on recent rocket fire from Gaza on Israel, Peres wondered, "Why are they firing? Gaza is not occupied. We gave it back freely, there are no Israelis there, nor will there be. "I hope those who aspire for peace and are not trigger-happy, would be the ones to prevail." See all talkbacks "Peres: Soldiers were beaten for being humane"